This little myth comes from the fact that for many people their first contact with a professional photographer is when they are getting married. The quotes they receive to record their wonderful day often leave them speechless (Photographer Nikki Wagner wrote a brilliant response to a Craigslist post on wedding pricing that explains wedding photographers costs. Read the full response here). The reality is that a client often only sees the photographer actually physically taking photos for about 15-20% of the actual time required to carry out the job. That's a conservative estimate incidentally. Some photographers would say it's even less. Somebody also has to pay for the hours and hours and hours behind a computer editing, the array of complex and expensive equipment used to photograph that wonderful day, and somebody has to have taken the time and effort to learn how to use that equipment. The only photographers that I personally know who have a lot of money, are those who had a lot of money before they became photographers. The photographers I know of who make a lot money, tend to earn that income doing things that are ancillary to the photographic enterprise but do not necessarily involve them taking photographs (a local photographer comes to mind who sells specialist equipment and software on top of shooting images...oh and he had money before he started doing this). Myth 2 - You Get To Earn A Living From Your Hobby! This is the driving reason for many would be professionals to take the plunge, quit the day job and start doing photography full-time. After all, what could be better than doing the thing you love for work. I absolutely 100% agree with this premise. The only problem is that it's a myth. Does your hobby include hours and hours (make that days and weeks actually) of editing, key-wording, online marketing, social media, invoicing, billing, book-keeping (did I mention keywording), client meetings and so on and so forth. Professional photography is first and foremost a business, with all the baggage that comes with running a business. If you are successful enough you actually get to the point where you are no longer taking photographs at all, but hiring other people to do it for you. Where's the hobby in that? The South African photographer Darrell Fraser put together this brilliant infographic that illustrates how a photographer really spends their time (read her blog post on the same here). The reality is that professional photographers spend very little of their time actively taking photographs. What's worse is that they usually end up shooting subjects that are very different to what they would have shot had they kept photography purely as a hobby. Does photographing product shots of shoes, pencils, hardware and shower-doors strike you as something you'd want to do as a hobby? The hard reality is that a professional photographer will shoot practically anything they are paid to shoot and sadly there are not many people who will pay exorbitant amounts of cash for you to photograph your favourite subjects (that has to happen in your spare time...if you have any). You need to be fully aware of the fact that turning your hobby into your profession has the very good chance that it will destroy your hobby. You run the distinct risk that you may not enjoy photography anymore once it becomes your job. Weigh this thought carefully! A colleague who is arguably one of the most respected landscape photographers in the world wryly commented to me that his students tended to have better and more expensive equipment than he did, because they could afford it and he couldn't. Yes, my gear bag looks pretty impressive to the one I cobbled together as a university student. But it still pails in comparison to that of some of my part-time workshop students. Peer into many professional photographers' bags and you will find a cornucopia of battered and bruised equipment, most of it far from new. As an example, while working with Joe Cornish a few years back it was interesting to see an old manual focus 28mm AIS and 50mm F1.8 AIS lenses in the gear bag. The reasoning: if it isn't broken why replace it. Another industrial photographer colleague, Charles Corbett, reasoned with with me when he was still shooting with Nikon D80s (rather than the D200 or D2x) that they were cheaper to replace, cheaper to insure and less emotional to lose to dodgy customs officers in certain countries on the continent. My own gearbag is a hodgepodge of secondhand equipment that I've carefully gathered together over several years of internet searching and simply meeting the right people. Yes, I have some lovely new lenses, but they were acquired when something broke and needed to be replaced beyond urgently (my one and only new GAS - Gear Acquisition Syndrome - purchase that is completely unnecessary is a Fujifilm XT-1). Every single one of my wildlife images, some of which have sold quite nicely through Getty Images, have been shot on an old, slightly fungused, 400mm f3.5 AIS lens released in 1983 and purchased secondhand (probably thirdhand) in 2000. Professionals tend to buy what they need, rather than what they want. If you want to own awesome gear (like a Canon 800mm f5.6 IS L lens) become a doctor and take up photography as a hobby. Okay so you do sometimes meet interesting people. I've had the extraordinary privilege to photograph Jane Goodall and have spent extended periods of time listening to various international and national politicians at things like COP17 and various big indabas where I was the commissioned event photographer. The thing is, when the event is over, the photographer gets turfed with the rest of the trash. I didn't get to hobnob with Jane Goodall and apart from a brief "stand here and smile" to Trevor Manual and Archbishop emeritus Desmond Tutu, I had little to no interaction with these supposedly famous and interesting people. I sure as hell wasn't invited to the after party. Maybe the myth revolves around fashion photographers, continuously perpetuated through American TV shows? The era of David Bailey and Patrick Litchfield is sadly over. There are photographers who do party hard and shmooze with the rich and famous, but they tend to fall into the same infinitesimally small percentage of photographers as those who are wealthy do. The photographers I know tend to be working too hard to take part in the party. If you are shooting fashion, chances are there's a deadline you have to deal with which is more important than the scantily clad model standing in the studio. Oh, and out of interest, a fashion shoot for a client is often exhausting. Nothing like the lovely scenes from Sabrina. But you do meet interesting people. They just might not be famous. One of the enormous perks of my job is the fact that I often have to photograph extremely interesting individuals. Take a look at some of the work by Limephoto photographer Paul Greenway and you will see how fascinating some of the people one gets to meet really are. Just don't be fooled into thinking that as a photographer you will meet and hobnob with famous people and in turn become famous. This is from an email I received a few years back: "I want to do wedding photography. What equipment do I need?" The person who wrote to me had zero experience in photography. Nada. Zip, She had fallen into the trap of Myth 1: Photographers Make a Lot Of Money, and figured that she could do this as an income stream. There is the general perception that photographers don't take photographs, cameras do. Time and again I've had students who are suddenly hit by the epiphany that, hey, this is actually hard work. Photography is not that easy. Apart from the fact that there is a voluminous amount of technical information and expertise that needs to be learned and mastered, there is the subjective aspect of craft and art thrown into the mix. As a general rule of thumb I like to use the analogy that Monty Cooper, a mentor of mine suggested. He surmised the difference between an amateur and a professional photographer was "a thousand rolls of well exposed film". This equates to Malcolm Gladwell's wonderful book 'Outliers - The Story of Success' in which the argument goes that to master any single thing, a person needs to devote at least 10 000 hours towards the study and practice of that thing. This means working at learning and practicing for 8 solid hours a day, 365 days a year (including Sundays, public holidays and Christmas and without breaks for the loo) for three and a half years! Photography is no different. To truly master an aspect of photography you have to single-mindedly devote 10 000 hours of learning and practice to the art. 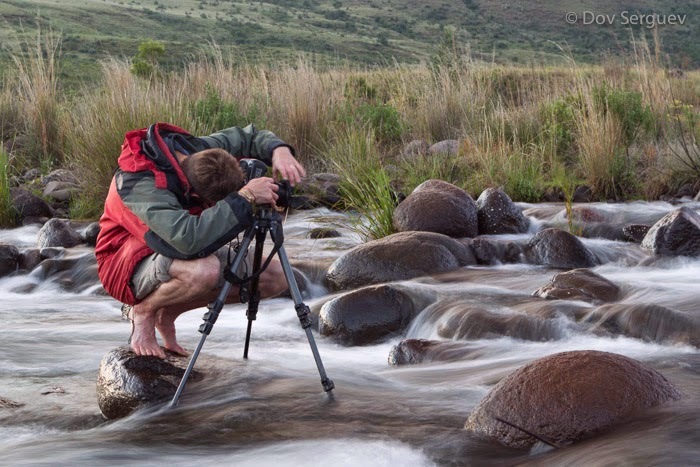 Professional photographers aren't 'lucky' to get that incredible shot. They have worked damn hard to put themselves into the right position, with the right knowledge and the right timing to capture that once-in-a-lifetime moment (and you should see the shots they missed). But photography will forever hold the allure that these myths beguilingly promise. Like the Sirens they beckon the unwary into a world of financial hell. Not all is doom and gloom though. Despite what I write above, I think my job ROCKS! Admittedly there are downsides to photography as a profession, which I'll discuss at some other point, but the positives are INCREDIBLE. Just go into it with open eyes, and forget the myths. They're just pretty stories. Thanks for solving many truths about the myths on photography. Before read your blog I also thinking that to being wedding photographers like milwaukeeweddingphotos.net our local Milwaukee wedding photographer there are need lot of money and invencements but your blog is changed my mind. And now I under stood that there are need talents to be a perfect wedding photographer. Photography skills with good marketing and networking , you can be successful freelancer.